Let's look at top 2 hard drive data recovery software for MacBook. Any Data Recovery for Mac is a utility which is specialized in recovering a variety of file types from Mac's hard drive and other portable devices like USB flash drive, external hard drive, SD card, iPhone and more. Data like photos, videos, audios emails, ZIP files, contacts, messages, etc. lust due to deletion, formatting, virus attack, software crash, altered/corrupted partition. The most important point that I highly recommend it here is that it supports to recover up to 500 MB files for free. Step 1. 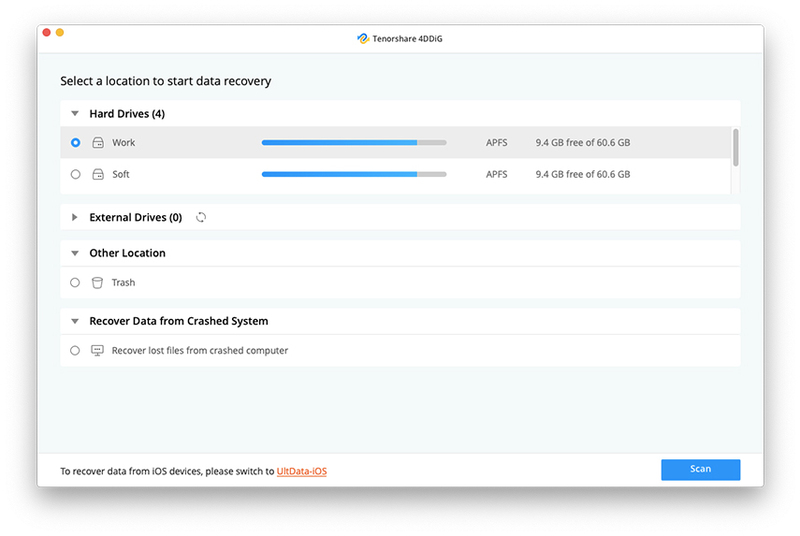 Install this MacBook hard drive recovery software on your MacBook and run it. Step 2. Select a location where you have lost the files and click "Scan" to start. Step 3. This program will soon scan your hard drive and display the files found. You can preview and decide which files to recover and then click "Recover" button to save. The other MacBook data recovery software free is Card Data Recovery for Mac, which is similar to Mac Any Data Recovery introduced above. It offers Quick Recovery and Deep Recovery modes for your choice. As for the interface, I prefer Card Data Recovery for Mac as it is simpler. However, this Apple MacBook data recovery software only allows you to recover three pieces of files with trial version, which is a little disappointing. Step 1. Install this program on your MacBook where you lost files and launch it. Step 2. Select one recovery mode from "Quick Recovery" and "Deep Recovery". Step 3. Specify the volume and the items that you want to recover. Mac's hard drive, SD card, USB flash drive, CF card and other external devices.